Warm up for 5 minutes with an easy spin. Gradually increase bike tension just enough to where you're working harder, but you don't feel like you're grinding up a hill. The intensity will come from a sprint rather than hard tension. For the intervals, sprint all out for the indicated time followed by the prescribed recover time. Repeat each Interval five times through for a total of 5 minutes for each Interval. Repeat these intervals as many times as you like depending on the time you have available remembering to take 5 minutes for an easy cool down. 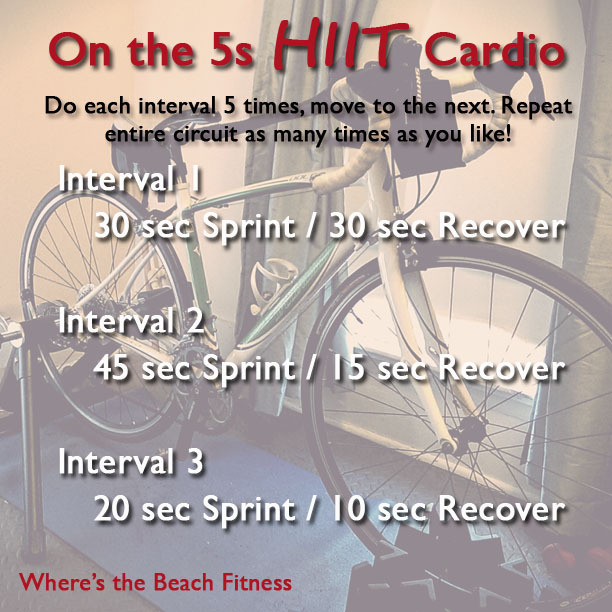 *Repeat this interval a total of 10 times to = 5 minutes. Each 20:10 segment is 30 sec. Note: You can easily do this same workout on a treadmill (or the pavement), elliptical, rowing machine, or stair climber.